A protest against Ahok on November 4, 2016. In a district court in north Jakarta on Tuesday, judges found Ahok guilty of blasphemy and accused him of causing unrest and insulting Islam. 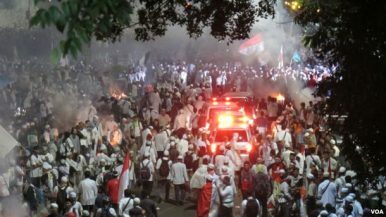 The verdict was no surprise – blasphemy cases have a 100 percent conviction rate in Indonesia, and it would have been politically explosive to acquit him. But the severity of the sentence shocked many, especially as the prosecutors had requested probation rather than prison for Ahok. Ahok rose to prominence as Joko “Jokowi” Widodo’s deputy governor, and became Jakarta’s governor when his predecessor was elected president. Widely respected across the religious divide for his efficient and effective governance, and perceived as unusually untarred by corruption, Ahok was poised to win his own electoral mandate in the gubernatorial elections last month. He is the symbol of Indonesia’s diversity, a double-minority: ethnic Chinese and Christian. As a Christian governor of the capital of the world’s largest Muslim-majority nation, he was an advertisement for Indonesia’s religious pluralism. Now he is the poster-boy victim, the most public example of a creeping Wahhabization of the archipelago. Ahok’s troubles began in September last year, when he made a speech quoting a Quranic verse in an attempt to address concerns that his political opponents may use it to discourage people from voting for him as a non-Muslim. He was then falsely accused of criticizing the verse itself. Several conservative Islamic groups filed a case against him after his statement went viral via a doctored YouTube video. Formally charged with blasphemy, his trial began in December, drawing crowds of up to half a million onto the street calling for his imprisonment. Counter-demonstrations in his support were also held, revealing a city, and a country, deeply divided. His political opponents ruthlessly exploited the case, playing the religious card and courting the Islamists. Although ahead in the first round of voting, Ahok ultimately lost the governorship to Anies Baswedan, Indonesia’s former education and culture minister, last month. Baswedan won the support of former presidential contender Prabowo Subianto, a retired general accused of serious human rights violations, and the leaders of the Islamic Defenders Front (FPI), Indonesia’s most notorious Islamist vigilante group, known for attacks on Christians and other minorities. Baswedan has a reputation as a moderate, but by giving the Islamists such a prominent role in his victory, he has provided them with a platform that will further embolden them. Outside the court on Tuesday, they mobilized crowds to celebrate Ahok’s conviction, calling for him to be hanged and shouting “Allah-u-Akhbar” (“God is great”). All this is part of a bigger picture. It is widely believed that factions of the army may be maneuvering to undermine President Jokowi’s attempts to investigate past crimes. Ahok’s imprisonment, it is suggested, is phase one in the operation, with other political figures from minority backgrounds next in line. So what can the international community do? First, strong support should be given to Jokowi’s efforts to investigate the army’s past crimes and address impunity. Second, world leaders must stop praising Indonesia as a role-model of moderate Islam. That strand still exists and should be encouraged, but as a nation Indonesia is now flirting with extremism. The moment for holding Indonesia up as an example of pluralism has passed; now is the time for action to tackle current extremism and prevent the country slipping further down the slope of intolerance. In particular, the international community must urge Indonesia to repeal the blasphemy laws, which are so widely misused. Such laws are wrong on all levels, and have no place in the modern world. In legal terms, they suffer from three weaknesses — poor definition, proof of intent, and requirement for evidence. The charges against Ahok are like the trial in Alice in Wonderland. The only people who caused unrest were the Islamists who mobilized protests. Ahok has consistently expressed his deep respect for Islam and Muslims, and in any case, the idea that a religion itself can be “hurt” should be challenged. Religions consist of ideas and beliefs, which are there to be explored, critiqued, questioned, rejected, or embraced, depending on a person’s conscience. Only people can be “hurt,” and if it becomes a criminal offense every time a person feels insulted, no one would ever say a word. Indonesia is founded on a tradition of pluralism, encapsulated in the state ideology known as the Pancasila, which protects equal rights for all the recognized religions. It prides itself on its reputation as a homeland for moderate Islam. But in recent years the warning signs of extremism have grown. In 2014, Christian Solidarity Worldwide published a major report, Indonesia: Pluralism in Peril – The rise of religious intolerance across the archipelago, documenting recent trends of violence and discrimination against minorities. Ahok’s case makes it clear now that Indonesia’s pluralism isn’t simply in peril, it is on life support – with an ugly cohort of soldiers, political rivals, and hardline Islamists poised to pull the plug. The world must wake up, and help Indonesia’s moderate, democratic president pull his country back from the brink. Benedict Rogers is a writer and human rights activist specializing in freedom of religion or belief, and works as East Asia Team Leader at Christian Solidarity Worldwide, based in London.